When you have the name of one of the most well-known actors in the history of Hollywood, it is easy to be recognized. That is the plight of St. Paul Saints outfielder Burt Reynolds. For 29 years he has heard the jokes, been asked how he was given the same name as the star of Smokey and the Bandit, and heard the nicknames, however, no one should believe that that outfielder has lived in the shadow of the Hollywood icon. This Burt Reynolds has built an impressive resume of his own and, since joining the St. Paul Saints, has been one of the key figures that has helped this team to rise to the top of the North Division as they look to reach the playoffs after a one year hiatus. While Burt Reynolds may not like being compared to the famous Hollywood actor, the reality is that he was actually named after the Bandit. His father heard the name on a television program and thought it was absolutely ideal for his own son. Thus, the legend was born. While Burt dabbled in other sports, his first love was baseball. It was a tradition in his family; one he committed to following. The outfielder was selected out of high school by the Tampa Bay Rays as a draft and follow prospect, and opted to attend Okaloose-Walton College (Niceville, FL). He spent a season there before signing and joining the Tampa Bay organization. Burt began 2008 at Princeton (Rookie League) where he hit .289 in 58 games with 6 homers and 36-RBI. He was promoted to Low-A Hudson Valley a year later and split time between Hudson Valley and Mid-A Bowling Green a year after that. Combined, he hit .221 with 3 homers in 68 games and would be released at the end of the season. After his release, Burt Reynolds knew he had a lot of baseball to play. He opted to sign with Newark in the Can-Am League, where he spent two seasons. In 2011, Burt hit .232 with 13 homers, following that up in 2012 with a .232 average and 7 homers in 53 games. A season later, he moved to Camden in the Atlantic League, where he hit .247 with 6 homers in 71 games. That was enough to earn him a return to affiliate ball, signing with the Seattle Mariners. The then 25-year old was sent to Mid-A Clinton to begin the year, but would move to High-A High Desert for the majority of the season. Combined, Burt hit .267 with 16 homers and 56-RBI. That performance earned him a return to the club the next season, as he would begin in Clinton, but would move to AA-Jackson by season’s end. In 85 games, Reynolds combined to hit .227 with 9-homers and 29-RBI. The Mariners would release him at the end of the season, and Burt opted to sign with Texas in the American Association for the 2015 season. The outfielder got off to an amazing start, hitting 23 homers in the first 68 games. 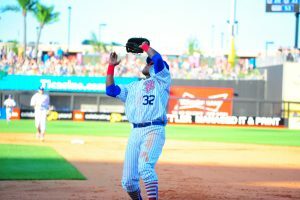 He was dealt to the Laredo Lemurs for the remaining three weeks of the season, and was only able to add one more home run, but he still hit a career high in homers with 24 and was chosen to represent his team in the American Association All-Star Game. The next season, Burt moved to the Sioux Falls Canaries where he put together his most complete season to that point. Reynolds hit .283 in 96 games with 16 homers and 68 RBI. He also blasted 24 doubles and scored 61 runs, while stealing 34 bases. The 2018 season began with high hopes in Sioux Falls, as the Canaries finished the 2017 red-hot and added some key pieces that looked to make them one of the more formidable teams in the North Division. However, the hot ending to the previous season did not carry over into the 2018 campaign, as the offense simply did not materialize. Burt Reynolds was not immune from the early season struggles. He was hitting .240 with 4-homers through the first 33 games when he was released. Burt had no doubt that he could still hit and, when the St. Paul Saints came calling, it was a no-brainer that he was headed to Minnesota. While it may have been a great fit for Reynolds, it was a brilliant one for the Saints. In his second game in the St. Paul uniform, Burt clubbed two homers and drove in five runs. He was an instantaneous hit and has continued to be so, but the outfielder has not been gloating about his success. Instead, he has been putting it at the feet of the 22 guys in his locker room. Burt Reynolds is one of the most respected players in the American Association because of how he approaches the game. Even opponents find his positive attitude contagious and that is something that he takes a lot of pride in. Keeping a positive attitude in baseball can be difficult, especially when things aren’t going your way. It’s hard to fail 75 percent of the time and still keep your head up, but faith has been something that has helped to keep Burt pushing toward his ultimate goal. “God influences me in everything. I feel that everything happens for a reason. My mom always tells me to pray and I keep up with that. Sometimes when you think you’re done you don’t have anything left, keep praying and things will work out for the best. There is one more person who is helping the Saints slugger to stay focused and keep driving for his ultimate goal of reaching the Majors – his daughter. In fact, he loves that his No. 1 fan is keeping up with her famously named dad. Since joining the St. Paul Saints, Burt Reynolds has returned to being one of the most feared hitters in the American Association. He has hit 12 homers in 44 games, giving him 16 total for the season, tied for second in the league. He has 39 RBI, scored 31 runs, and has stolen 11 bases. Burt has a .292 average during his time with the Saints and, with 29 walks, he has an impressive .397 on-base percentage. Those numbers should be good enough to earn him a spot with an affiliate club, but the outfielder is realistic. He will be 30 on September 13 and that is often seen as past a player’s prime by Major League organizations. However, the Saints slugger is not deterred. Burt Reynolds may never reach his goal of playing in the Major Leagues, and that would be a real shame. 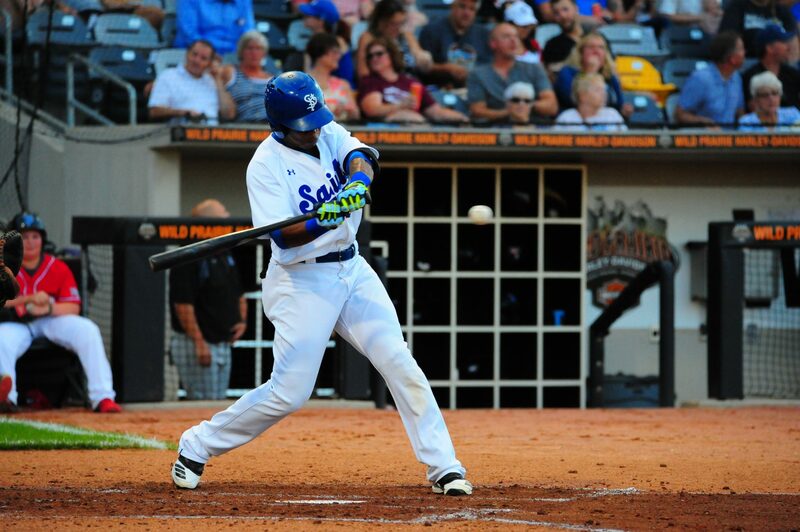 The St. Paul Saints star outfielder has proven that as he has matured as a player and as a man. However, no one should tell him that his time may have passed him by. The slugger knows he can make it all the way to the Majors and so, until he does, he’ll just keep his foot hard to the pedal and never mind the brakes. Major Leagues – next stop!